The Chevrolet Corvair fast car? Due to a small town lawyer many years ago the Chevrolet Corvair was put out to pasture. By now we all know the story. But, the Corvair has a following today and even though the prices have held firm the love for these rear engine cars is growing. I saw four at our last show. One funny moment though when I asked what engine was in his Corvair he said a four. I replied it had to be a six and he opened the hood and there was a six. Folks, know your own car please or get the Bozo award for being a clown. I admit I never liked the car. I never liked working on them and did not mind they went away. Now, many moons later I appreciate them much more. They are roomy, low to the ground, have decent power, and the look grew on me. Of course there is the racing Corvair and that is a winner of a racer but we will stay on course with the standard model. 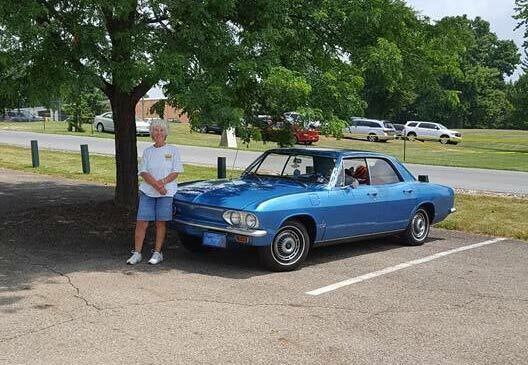 The picture shows a gleaming Corvair owner at a car show. The point is not everyone needs a big engined Ford, Chevy, or Dodge to be in our hobby. Everyone is welcome. Yes, Corvairs as well as all classics are welcomed. We want your input. We desire your thoughts and we want your pictures of your special car. So, please send them into us so we can see what makes you happy. And no pictures of an ex wife please. We have them already. Related ItemsThe Chevrolet Corvair fast car? ← Previous Story The First Ever Ford Motor Company Building.